Mouth-To-Mouth In CPR Might Be Overrated : Shots - Health News A study out of Arizona found that cardiac arrest patients who received hands-only CPR had a higher rate of survival than patients who received conventional CPR and those who didn't get CPR. If the prospect of locking lips seems like an unsavory requirement for performing CPR, don't worry. A new study says you don’t have to use your mouth to save a life. A study out of Arizona found that adult cardiac arrest patients who received hands-only CPR had a higher rate of survival than patients who received conventional CPR -- which consists of both chest compressions and rescue breaths -- and those who didn't get CPR. According to the American Heart Association, 300,000 people experience out-of-hospital cardiac arrest each year in the U.S.
"Anyone who can put one hand over the other, lock their elbows and push hard and fast can save a life," said lead author Bentley J. Bobrow, a medical director for the bureau of emergency medical services and trauma system at the Arizona Department of Health Services. The paper, which is slated to be published in the Oct. 6 issue of the Journal of the American Medical Association, evaluated the results of a public education program in Arizona that promoted compression-only CPR. The authors cite previous research showing that removing the mouth-to-mouth part of CPR makes it easier to perform. The research looked at 4,415 adults in Arizona who went into cardiac arrest outside a hospital during a five-year period. Of those, 2,900 didn't get CPR, 666 received traditional CPR and 849 received hands-only CPR. Researchers excluded cases from the study population for several reasons, including if CPR was performed by a medical professional, if it was performed in a medical facility or there was missing data. 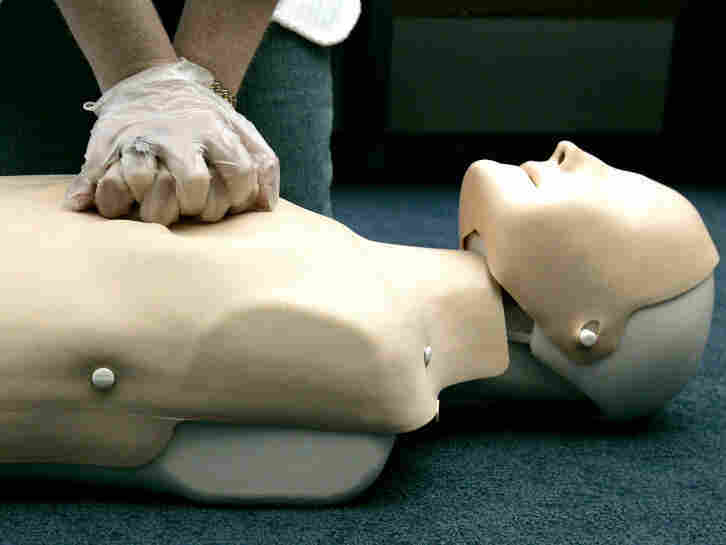 Those who received hands-only CPR had a 13.3 percent rate of survival to hospital discharge. Patients who didn't receive CPR had a 5.2 percent survival rate, and those who got conventional CPR were only slightly better at 7.8 percent. Researchers also found that the rate of people providing CPR went up over the five years of the study as did the rate that the hands-only method was used. This research follows two studies in the New England Journal of Medicine that found chest compression-only CPR is at least as effective as the traditional method. But Bobrow told Shots that the American Heart Association guidelines make the final call on whether compression-only CPR will be universally considered on-par with conventional CPR. Bobrow says that it's important to note that this only applies to adults -- children, he says, need the rescue breaths. That's because in children, a respiratory emergency frequently precedes the cardiac arrest, he says. He says that if other communities implemented a similar public health education strategy, they could save thousands a year. "We really believe that other communities can and will implement a similar effort," Bobrow says. "Really, there is a huge potential."